Though it's Halloween, I am getting ready for my Christmas stamp-a-stack next week. Here is one of the cards we will be doing. 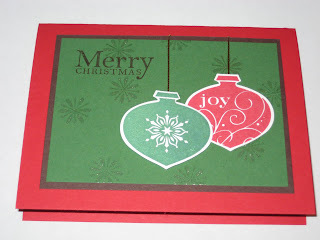 I used the shimmer paint from the mini catalog to stamp the background snowflakes. It's a subtle shimmer, but looks great in person.